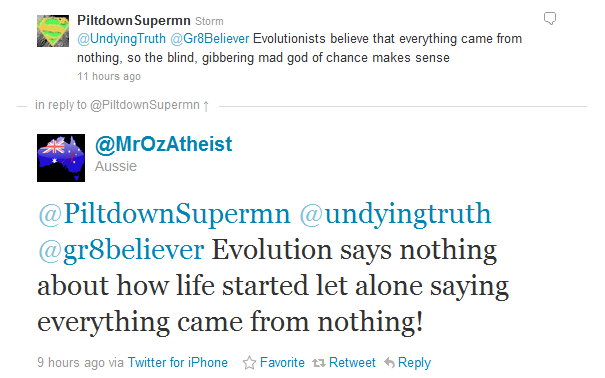 Proponents of evolution will sometimes attempt to distance themselves from the problem of the origin of life itself. Some will deny that evolution has anything to do with that subject (which is news to writers of textbooks, Neil deGrasse Tyson's Cosmos, David Attenborough's First Life and so on). But still, they defend the arbitrary, circular reasoning of the failed Miller-Urey experiment and try to find explanations for abiogenesis, even though it violates scientific laws. The most logical explanation is that life was put here by the Creator. Goo-to-you, molecules-to-man, chemicals-to-cats,abiogenesis—all these terms refer to the essential starting point for evolution of life through natural processes. Yet in a massive review published in the American Chemical Society’sChemical Reviews, researchers report, “The origin of life is a fascinating, unresolved problem.” And it will remain unresolved for them until they acknowledge God’s eyewitness account of the origin of life in the Bible. Cosmos host Neil deGrasse Tyson, in the first episode of the new series, says, “The origin of life is one of the greatest unsolved mysteries of science”. Scooping up some water, Tyson adds, “That’s life cooking, evolving all the biochemical recipes for its incredibly complex activities.” Yet while evolutionary scientists, educators, and television personalities promote supposed transitional forms, if they cannot get living cells to evolve from non-living elements through natural processes, their supposed evolutionary extravaganza is over before it starts. In “Prebiotic Systems Chemistry: New Perspectives for the Origins of Life,” Ruiz-Mirazo and colleagues, biophysicists and biochemists specializing in molecular evolution, spend 82 pages detailing all the things that have failed to demonstrate how life began on its own. You can read the rest at "Attempts to Trace Life Back to Chemical Origins Maps the Willful Ignorance of the Hunters".